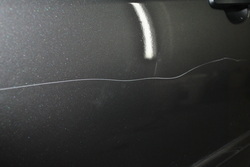 Over the years I have perfected a method for deep scratch repair as shown beside. 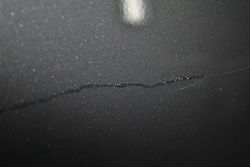 I request that clients bring a bottle of touch up paint with them (I can advise the best place to purchase it) so that I may touch up and level any deep scratches in the paint. The rule of thumb is that if you can feel it with your finger nail, then it needs to be filled with touch up paint and leveled. Please review a recent job on a Toyota Corolla. 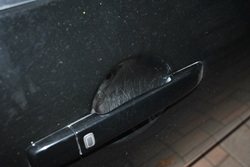 First the scratch was inflicted by a key that ran along two doors and was deep. 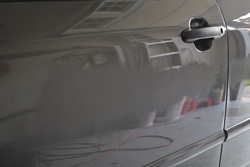 Next the scratch gets filled with touch up paint and is allowed to dry overnight. The next step is to wet sand the area flat. The final step is to polish the area back to perfection. 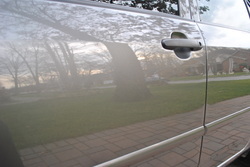 Other scratches, like the ones typically inflicted from opening door handles can be compounded and polished out. 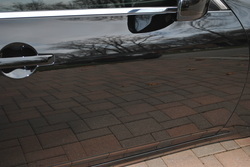 2010 Lexus 250h with scratched bumper.